The summer months were always colored yellow or orange, autumn was red and brown, and so on. 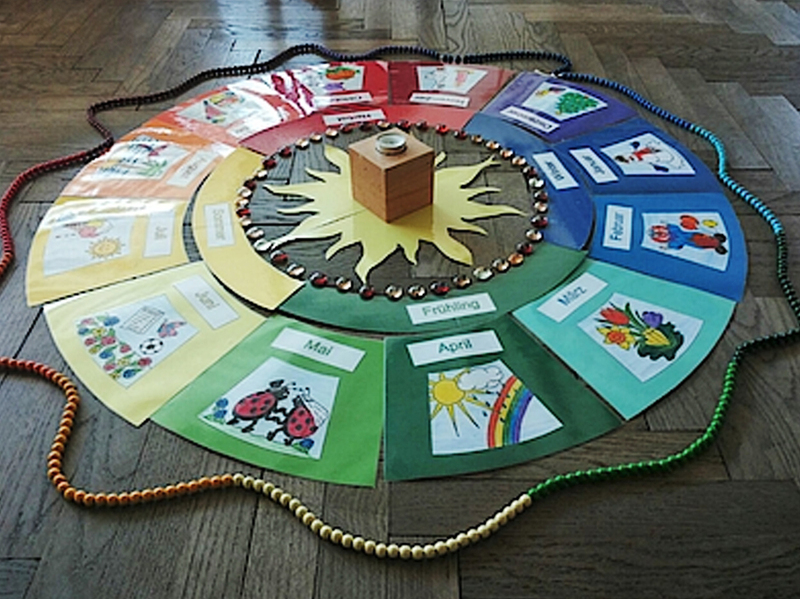 I recall an exercise where we were given tiny vegetable magnets and we would walk around the circle to place certain foods during the time of year they could be grown or harvested. We did similar activities with birthdays, holidays, season changes, everything. Now, when I think about a year, I imagine this giant circle that I can march along as each month goes by. My whole conscious life since then has walked along this circle. I pace in my head with each month. April has its own weather, January has its own foods, November its own colors, August its own birthdays. I think about where I was when I paced that part of the circle last, and how I felt. To me, time is a round thing. A moment is a point on that circumference. When I walk this circular path in my own head, it feels like a clock. My steps on this path pass like seconds of a larger scale, until they complete an entire cycle and I arrive at that time again. Every walk feels different. Maybe my stride is bigger, maybe February, March, and April all passed like familiar trees on my yearly circumference. On some walks, I think so much more. I might slow down for a person, for a good idea, for flowers. Some months have seasonal blooms, and others have showers. Some years, as a whole, feel so much longer than others. I imagine these years as wide as possible in my head. There are so many moments to ponder in each step, and when I think about them, I hover. I float above ground to understand how long and important they were. I survey the year as a whole, picturing all the months sprawled out along a giant circle. Thoughts, plans, and motions stay suspended and assigned to a point. I recall every detail. Trees and flowers, picture perfect, are still seconds on a walking path. These years are incongruous with shorter years—there are many months I forget. I might walk the same circle every year, but what I know and who I meet make big differences in its diameter. The more vegetable magnets and weather changes and birthdays and flowers to stop and smell, the wider my circle, the longer my year. The less vegetable magnets, the shorter my year. Have you said a half-hearted goodbye? Rushed through it by simply echoing back what they said? “It was nice to meet you!” “Oh, it was nice to meet you too?” When was the last time you replied with something honest, putting more effort into that moment, making it memorable and last longer? This subjective infinity is my favorite trick of time. A year is a real, fixed cycle—seasons and foods and the rhythms of nature I learned in elementary school taught me this much. But a year can be made infinitely wider and longer in my imagination with little feelings and beautiful details, or infinitely small and short if I feel and notice nothing profound at all. More than passing landmarks, our memories and magnets can be the most detailed gardens and rivers if we pay attention. Though these moments may still fall in the imagination of a point on the circumference, vast and enriching landscapes might hide in how we perceive our favorite days. We can go in perfect loops with full strides or half-steps or dainty skips or heavy marches until we get where we need to be. We can take as many steps as we want, or as few. In fact, the number of steps we take can be never-ending—our strange, irrational ratio at work. If the ratio of the width of my years is truly never-ending, only at some points in my conscious life have I felt that infinity even remotely. These are the sporadic moments that I thought lasted forever, the long memories. I think I have many more moments, or months, where I simply rounded or walked eagerly to where I needed to be. Pi is infinite, but we truncate it, considering only as many steps as we need after that decimal point. To live long, truncate less. By nature, we’re supposed to understand more with more time, so each year is supposed to expand like nested rings, each step meaning a little more. But I know it’s so easy not to. We make small talk, echo cheap compliments, walk fast, work half-heartedly. But I also know complacency in letting the moments pass without wandering into their infinity of emotions and possibilities is so dangerous that it’s probably sinful. Let the infinity of that moment stay a while, breathe deep and full and rhythmically. Our time is ultimately a choice of attention. A year is a real, fixed cycle, but really, we pick the speed of our revolutions. The way I imagine it, circles are the temporal bodies of cycles. We run their course. If not profound, at the very least, our time is round. Its rhythm by year, day, and step is designed to give us another chance. March on… or take a few moments in the May flowers.